(CNN) -- Sen. John McCain on Tuesday proposed lifting the ban on offshore drilling as part of his plan to reduce dependence on foreign oil and help combat rising gas prices. Sen. John McCain says it's time for the federal government "to put our own reserves to use." "The stakes are high for our citizens and for our economy," McCain, the presumed Republican nominee for president, said at a press conference Tuesday in Houston, Texas. "For years, the president has pushed Congress to expand our domestic oil supply, but Democrats in Congress have consistently blocked such action," she said. "And with gasoline running at more than $4 a barrel ... a gallon ... I wish ... $4 a gallon, many do not have the luxury of waiting on the far-off plans of futurists and politicians," he said. "We have proven oil reserves of at least 21 billion barrels in the United States. But a broad federal moratorium stands in the way of energy exploration and production. And I believe it is time for the federal government to lift these restrictions and to put our own reserves to use." Florida Gov. Charlie Crist had expressed opposition to exploring coastal waters, but he said this week he supports McCain's plan to lift the moratorium and would not rule out letting his state choose to drill offshore. "It's the last thing in the world I'd like to do, but I also understand what people are paying at the pump, and I understand the drag it is on our economy," Crist told the St. Petersburg Times. "Something has to be done in a responsible, pragmatic way." The current law, which has been in effect since 1981, covers most of the country's coastal waters. "The next president must be willing to break with the energy policies, not just of the current administration, but the administrations that preceded it, and lead a great national campaign to achieve energy security for America," McCain said Tuesday. McCain on Monday said incentives could possibly be provided for states that choose to permit exploration off their coasts, adding that "exploration is a step toward the longer-term goal." Tuesday's discussion marks the first in a series of talks about America's energy security that McCain will hold during the next two weeks as he lays out his plan to reduce the country's dependence on foreign oil. "When America set aside the Arctic National Wildlife Refuge, we called it a 'refuge' for a reason," he said. 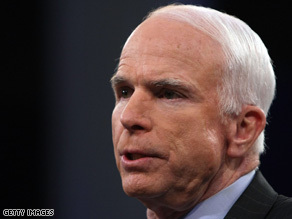 McCain also criticized the energy policy of Democratic rival Sen. Barack Obama. "He says that high oil prices are not the problem, but only that they rose too quickly. He doesn't support new domestic production. He doesn't support new nuclear plants. He doesn't support more traditional use of coal, either," McCain said. "So what does Sen. Obama support in energy policy? Well, for starters, he supported the energy bill of 2005 -- a grab bag of corporate favors that I opposed. And now he supports new taxes on energy producers. He wants a windfall profits tax on oil, to go along with the new taxes he also plans for coal and natural gas. If the plan sounds familiar, it's because that was President Jimmy Carter's big idea too -- and a lot of good it did us." McCain argues that a windfall profits tax will only increase the country's dependence on foreign oil and be an obstacle to domestic exploration. "I'm all for recycling -- but it's better applied to paper and plastic than to the failed policies of the 1970s," he said. "John McCain's support of the moratorium on offshore drilling during his first presidential campaign was certainly laudable, but his decision to completely change his position and tell a group of Houston oil executives exactly what they wanted to hear today was the same Washington politics that has prevented us from achieving energy independence for decades," he said. "It's another example of short-term political posturing from Washington, not the long-term leadership we need to solve our dependence on oil," he said. Democratic Florida Sen. Bill Nelson also criticized McCain's plan, saying it would ruin his state's tourism industry and would not solve the problem. "I thought John McCain was serious when he said he wanted to make America less dependent on oil. I didn't think he was a flip-flopper. He knows that more drilling isn't the solution to high gas prices," Nelson said Tuesday.